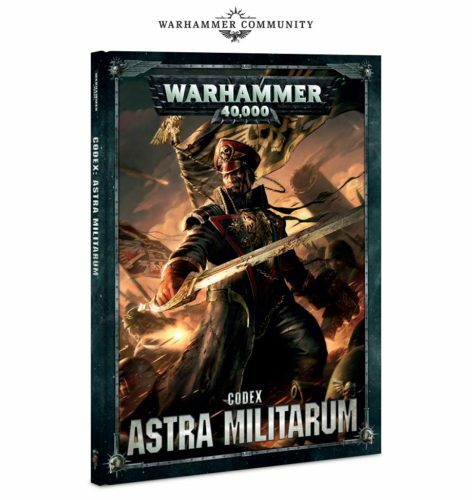 Codex: Astra Militarum is the next codex in line for Warhammer 40,000, and it’s just as packed with new content as its predecessors. We’ve seen rules for Space Marine Chapters, Traitor Legions, forge worlds, and now there are rules for 8 regiments of the Astra Militarum. Which regiments, you ask? Cadia and Catachan will, of course, be included, as well as new rules for Armageddon, Tallarn, Valhalla, Vostroya, Mordian and the Militarum Tempestus. 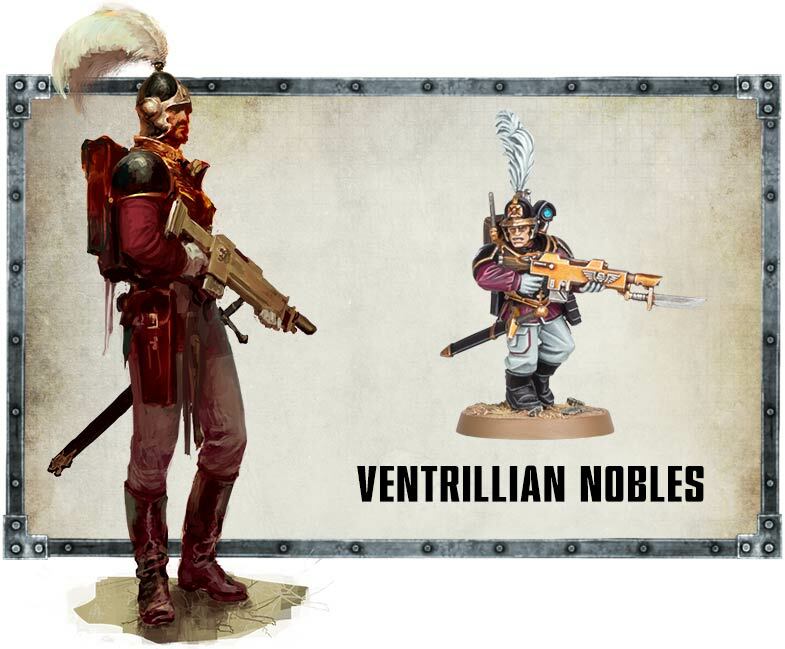 Each one of these factions will be getting its own regimental doctrine, order, stratagem, relic, and warlord trait – the codex is absolutely brimming with content, aimed at letting you customise your army to suit your style of play. Similarly, the codex is set to diversify Astra Militarum lists with tweaks to rules and points aimed at putting each unit on an even footing. Conscripts, for example, have been changed to better reflect their inferior discipline compared to professional soldiers. 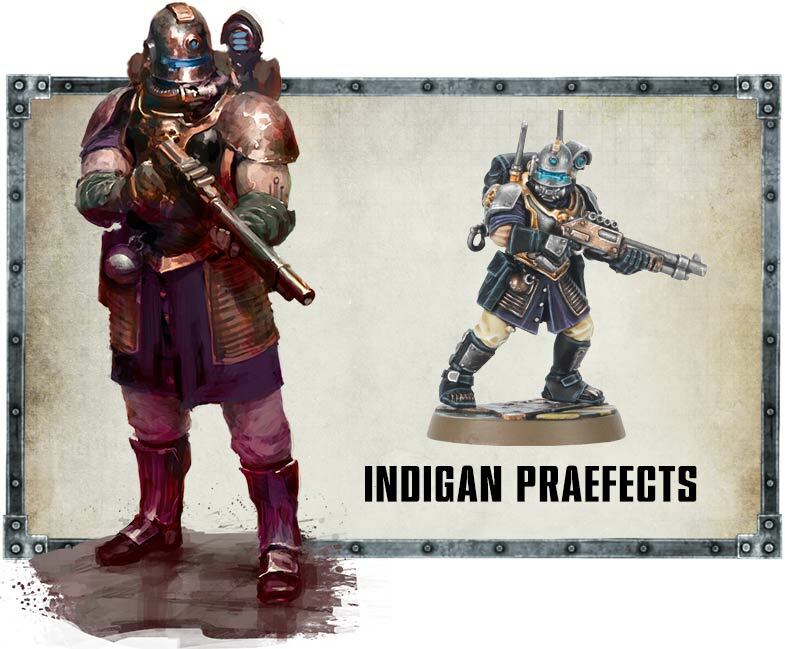 It’s not just about rules, either – the new codex contains loads of new background and art, including a look at some of the more unusual regiments of the 41st Millennium and advice on how you might want to convert them. Of course, if you’re starting a new Astra Militarum army, you’ll need somewhere to play them, and Moon Base Klaisus is perfect. Building your own boards is a fun and rewarding experience, but it’s not always practical for gamers who are limited by space or just want to set their games up quickly – the new Moon Base Klaisus set gives you everything you’ll need to get gaming in minutes on a great looking 6’x4′ board. 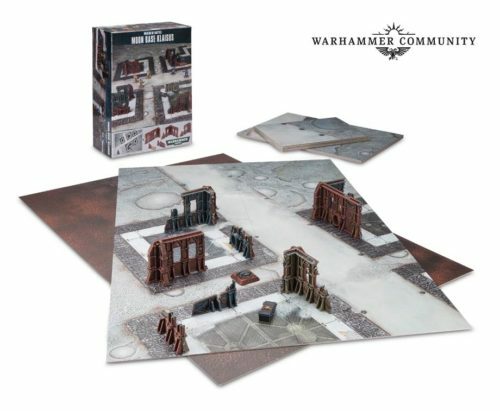 Made up of modular card tiles – designed to be interchangeable to vary your battlefields – and featuring push-fit ruins, Moon Base Klaisus is great for gamers looking for an easy way to make sure they’ve got a cool-looking place to play, wherever they are. The ruins themselves are designed to fit in with both the Sector Mechanicus and Sector Imperialis terrain, meaning if you do decide to build a more bespoke gaming board you’ll be off to a head start. Last edited by Khorne's Fist; 09-24-17 at 07:01 PM. That is really good, I'm loving the card tile battle board idea! 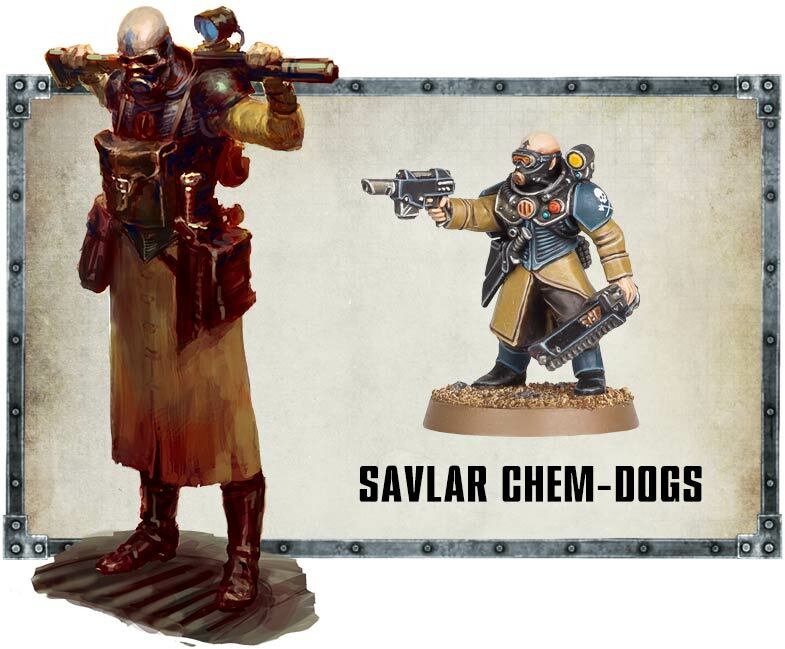 Looks like Genestealer Cult, Scion, and Skitarii parts. Shame they're all kit-bashed and not new models. GW could apparently launch a couple whole new lines variously combining kits. Kit bashing is fun and you can make some really great models doing that. But there is no way that I would try to field an army such as IG/AM (high model count) that is all kit bashed. Would like to see new lines. The possibilities are there and I'm pretty darn sure they would sell. On the Catachans, Brutal Strength looks like it will be hard to beat for armies with a lot of vehicles in them. It's a giant reliability boost to pretty much anything with a main gun. I saw the two Guard community posts and to be honest was underwhelmed. My 3rd ed catachans are becoming more likely to be relegated permanently to the loft. I was hoping for some flamer/mortar/hvy bolter bonuses, and the whole thing about "give your catachans lots of tanks" is rubbish. I'm still salty they got rid of the Catachan codex. @Brother Dextus They DO hint at a Catachan-specific order "Burn Them Out!" which should be a Flamer focused one, they just don't give us the exact rule... If it does something similar as the reroll hit # for vehicles, that should be properly terrifying. I still have my old school army with only infantry (in vet squads for the last ed.) with basically just flamers and melta guns. Hopefully they'll be useful wall of flame units again! I also really hope they sort out the 'platoon structure' and have something more akin to chapter tactics diversions. Armoured regiments, deathworld regiments etc. Tallarn used to be awesome, but got nerfed previously. I actually really like the Catachan rules-- so much so I might build a little army with them (or, rather, kitbash my own guardsmen and use those rules). I like the idea of being a little better at point-blank range from a higher strength, and I really like the re-roll random shots thing. It happens to have synergy with tanks but what it really is is much higher volume of hits from flamers and the like-- which is very Catachan!